A Saturday one car crash severely injured a teenage passenger in Freeport, Texas according to Freeport police. A 13-year old was driving the vehicle while 22-year old Andrea Cantu, the owner of the vehicle, sat in the passenger seat. 22-year old Rodney Harris sat in the back seat along with a 16-year old passenger. Police said the four were drinking alcohol and taking pills while at a party at a home in Freeport and when they left the 13-year old was driving. The underage driver backed into a pickup truck at a Bucees gas station but left the scene: the pickup truck owner followed and called police. The teen driver then crashed into a pole at Avenue A and Fisher. The 16-year old rear seat passenger was admitted to the Intensive Car Unit at Memorial Hermann – her arm was nearly severed in the collision but fortunately doctors were able to reattach it. Channel 11 story is here. If you, a friend or a family member have been injured in a car accident, Smith & Hassler’s experienced personal injury attorneys are available to give you a free consultation either in-person or by phone. Sometimes people injured in car accident wait before consulting an attorney. They have good intentions: not wanting to seem “sue happy,” waiting to see if their injuries will get better or because aninsurance adjuster is discouraging them from seeking legal advice (that happens). It is better to know your rights early in the process and have an experienced Houston personal injury attorney explain the steps involved in car accident injury claim and what you can do NOW to increase the chances of a good outcome. On Thursday August 25, 2011 Smith & Hassler trial attorney Daragh John M. Carter was able to secure a favorable verdict in Harris County District Court for a Smith & Hassler client who sustain a back sprain/strain in a May 2008 rear-end collision. The car accident happened when a female driver in her 20’s, insured by Allstate, was driving on Eldridge near Memorial with her purse in her lap. She had just left the bank and took her eyes off the road to move her purse to the passenger seat. When she looked up it was too late to stop and her Chevy Equinox rear-ended the Plaintiff’s Toyota Tundra. The Equinox sustained heavy damage and was deemed a total loss. Three days after the collision the Plaintiff saw a chiropractor and had a total of 11 visits and claimed 3-days of lost wages. Before suit was filed, while the suit was pending and all the way up to trial Allstate never offered enough money to cover the Plaintiff’s medical bills and continued to deny that the Defendant was negligent in causing the rear-ender. The morning of trial Allstate‘s attorney stipulate to liability, which means the Defense attorney told the jury that his client admitted she was negligent, and that the case was just about money. After a short trial where the only witness was the Plaintiff (the Defendant was unavailable at the time of trial) the jury returned a verdict awarding the Plaintiff his medical bills in full and 2.5 days of lost wages. An off-duty Missouri City Police Officer was injured Saturday August 27, 2011 when he was struck by a vehicle driven by suspected car burglars. The officer was working a side job providing security for a jewelry store in the Post Oak Plaza shopping district not far from the Galleria. He was escorting a customer to their car when he saw two black males in a silver four-door pull into the parking lot: the immediately got out and started peering in the windows of a parked Chevrolet Tahoe. Concerned that the men were about to break in to the Tahoe the officer approached and the men jumped into their vehicle and sped off, hitting the officer in the leg with their vehicle. The officer responded by drawing his pistol and opening fire on the vehicle. Several bullets found their mark and hit the car but it is unknown if either of the occupants were hit. The silver-colored vehicle also struck a parked car as it fled and should have obvious damage in addition to the bullet holes. Fortunately the officer is expected to recover from his leg injury. Anyone with information to share about the identity of the men or their vehicle should call HPD or Crime Stoppers at 713-222-TIPS. Here is Channel 13’s coverage of the incident. 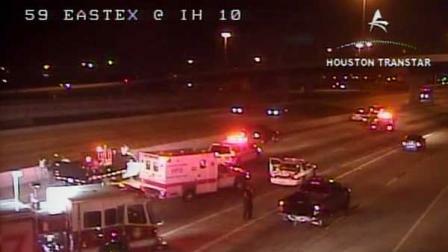 The Southwest Freeway was backed up Friday evening after a freak accident left a motorcyclist dead. The motorcycle was found standing upright leaning against the HOV exterior wall: its not clear at this time how the rider of the Suzuki lost control. At around 4:00pm the motorcyclist was heading southbound on the US59 South HOV lane near Edloe when the rider was ejected from the motorbike and fell 50 feet to the roadway of the lower freeway below, crashing through the windshield of a Toyota Camry. The poor motorbike rider was killed instantly authorities say. Despite what have must have been an incredible shock, the driver of the Camry was able to maintain control of his vehicle and came to a stop, suffering only cuts to his hands and arms. David Lee Cothran, Jr. aged 28 of Louisiana has been identified as the deceased motorbike rider. Mr. Cothran was wearing a helmet. Channel 13’s story is here. Channel 11’s story is here. Update: The injured driver of the Toyota Camry has been identified in a subsequent story as Mr. Kelvin Wesley. In an interview with Channel 11 News Mr. Wesley expressed his sympathy for the family members of the deceased motorcyclist and also expressed his thanks for his own family’s safety: apparently he had dropped his son off at University of Houston shortly before the accident. Mr. Wesley’s son had been sitting in the front passenger seat beneath the portion of the roof that sustained the most crush damage. Mr. Wesley is a high school football coach and was on his way to a game at the time of the tragic accident. 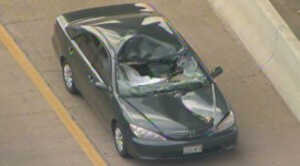 Channel 2 is reporting a motorcyclist died early Wednesday August 24, 2011 in a motorcycle crash. Investigators said that the 50-year old man appears to have made a last minute decision to take a different exit ramp at the 610 Loop and North Freeway and hit a center median that divides the two ramps. The man was ejected from his motorcycle and died at the scene. His name has not been released. Monday August 22, 2011: an off duty METRO employee died last night in a wrong way collision on Highway 59 near I-10 and two METRO employees were injured. 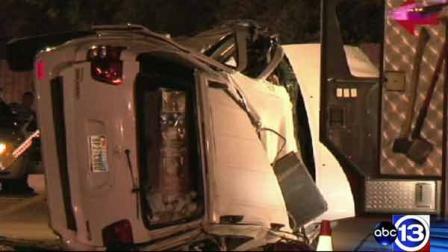 Police say a Cadillac (the wrong way vehicle) and a METRO truck crashed head-on at around 9:30pm. 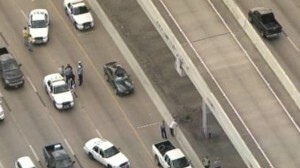 The off duty METRO employees in the Cadillac was killed. Channel 2 News’ report is here. The METRO employees in the truck were taken to Ben Taub Hospital. 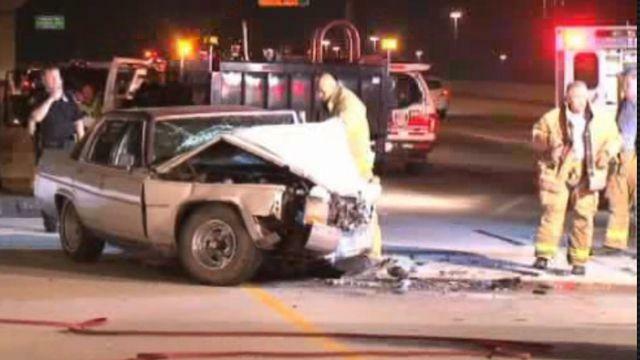 KHOU is reporting that drunk driving is suspected in a terrible crash that claimed four lives over the weekend. The two vehicle collision happened early Sunday morning in Brenham, Texas which is approximately 65 miles northwest of Houston. Roberto Castillo (19) of Brenham is currently in Washington County jail facing four counts of intoxication manslaughter with a motor vehicle. Police say that Castillo was driving a pickup truck that allegedly crashed into a car carrying the four victims who died in the wreck. Ironically it always seems to be the intoxicated driver who leaves a drunk driving accident with little or no injury. Investigators say Castillo ran from the scene of the accident but was apprehended at a nearby mobile home. 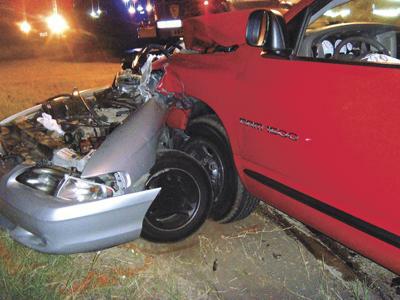 A report in the online Brenham Banner newspaper shows a disturbing picture portraying devastating damage to a silver-colored Ford Mustang. According to the Banner’s report, Castillo is an undocumented alien who only a few weeks before the deadly crash was detained by law enforcement for another alcohol related offense. The collision happened at the intersection of Highway 36 South and FM 109. Castillo was driving a Dodge Ram pickup truck. Channel 2 is reporting a fatal auto versus pedestrian accident that occurred this morning. According to investigators Deborah Destin was crossing the Sheldon Road exit ramp on I-10 before 5:00am when she was fatally struck by a car. According to deputies 35-year old William Mason was driving to work and did not see Ms. Destin. Channel 2’s report indicates that Mr. Mason was cooperating with the investigation and it was not expected that charges would be filed against him. Two people riding on a motorcycle were left in critical condition Saturday as a result of a collision with an SUV. A man and his female passenger were heading eastbound on Nicar in Houston when an SUV backed out of the driveway of a private residence. 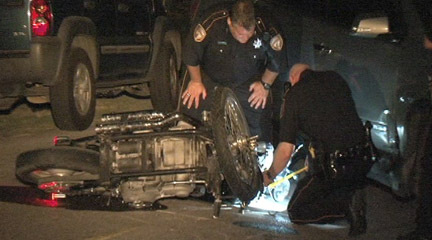 The motorcycle was unable to avoid a collision and slid into the side of the SUV. Both people on the motorcycle were transported by ambulance to Ben Taub General Hospital in critical condition; nobody inside the SUV was injured in the wreck. The accident happened on Nicar near Airline at around 9:30pm Saturday August 13th. The driver of the SUV was issued a citation for failing to yield the right-of-way to the motorcycle while exiting the private driveway. If you have been injured in a motorcycle accident, the experienced personal injury attorneys at Smith & Hassler will review your case for free and advise you of your legal rights, including how the insurance claims process works.